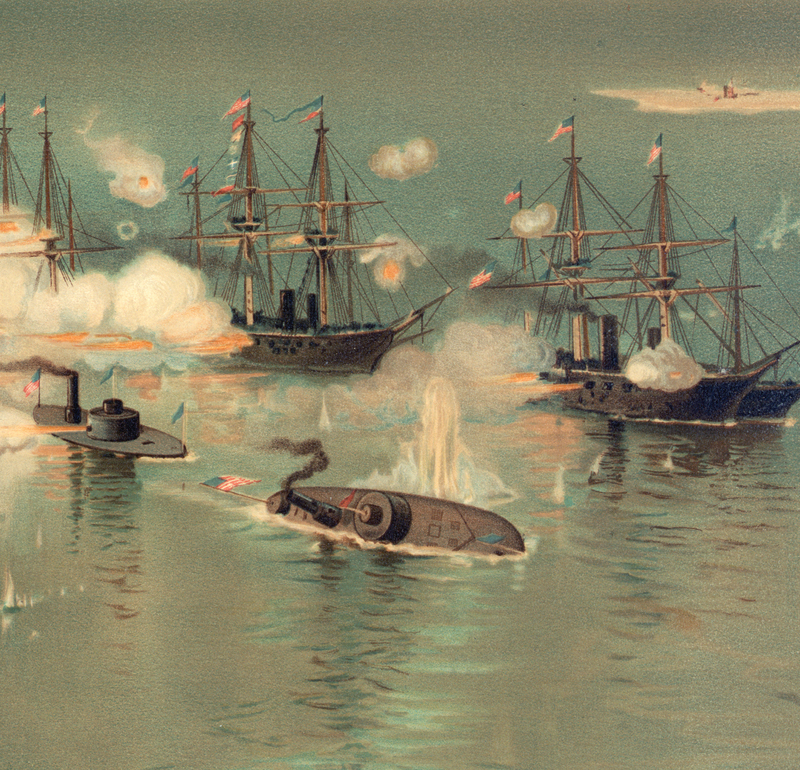 New technology and weapons used in the Civil War added aspects of modern warfare to traditional combat. The Confederate States pioneered a new tactic, the use of underwater mines, to defend its many waterways. 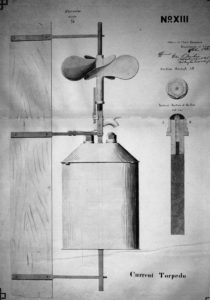 Although at that time mines were only experimental devices, a few visionary inventors recognized that their properties suited Southern needs and capabilities. The Confederacy introduced improved mines on a large scale and became the first nation to wage modern mine warfare. 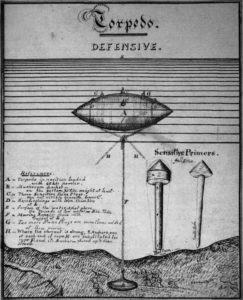 Note: During the Civil War, people referred to mines as torpedoes, after the torpedo fish (ray) that gives an electric shock. The self-propelled torpedoes we think of today were not invented until after the war. To avoid confusion, this exhibit uses the term mine. The introduction of true mine warfare raised serious moral debate. For most of the war, the Union rejected mine warfare as a dishonorable, immoral practice. Because the Confederate Navy was desperate to protect their extensive waterways, the Confederate Secretary of War assented to their use in defensive capacities. Gabriel Rains, a Confederate inventor of several mine primers and detonation mechanisms, felt mines had significant purpose in war as weapons and deterrents. 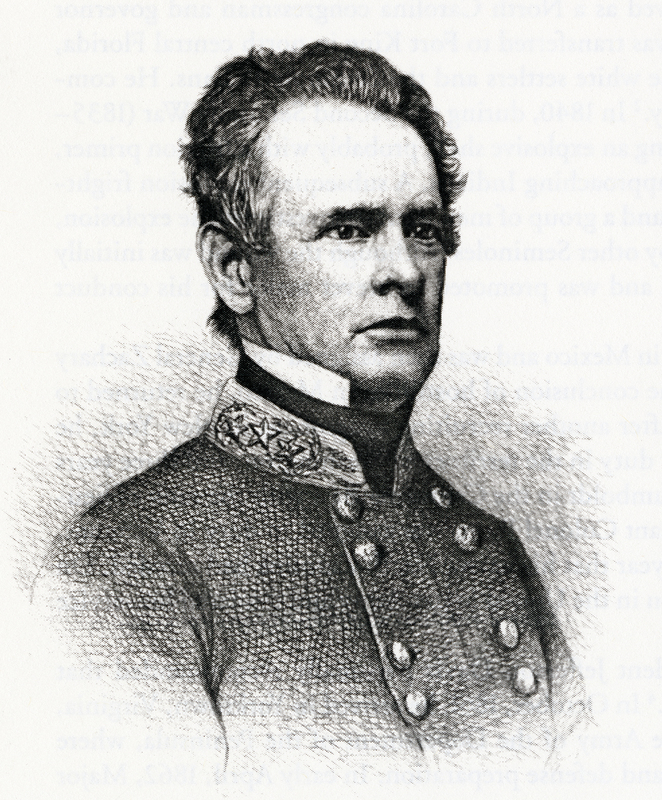 He helped initiate their use by the Confederacy and lobbied for their acceptance by Confederate leadership. As Confederate Secretary of War, George W. Randolph made the final decision regarding the adoption of mines by the Confederate States. Civilized warfare at the time permitted the use of lethal weapons only when doing so provided a clear military advantage. Randolph thus determined that while mines could not be used simply to kill enemies, they were acceptable in defensive contexts, such as protecting Confederate rivers and ports. Much of the Civil War was fought in the South, forcing the Confederates to protect thousands of miles of coastline with few resources. Mines offered the most effective tactic: they cost little to produce, worked well as defensive weapons, and could sink or damage large, costly Union ships. 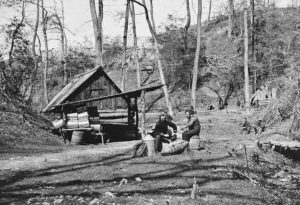 Confederates planted mines in Southern rivers as early as July 1861 and continued to use mines defensively through the end of the war. 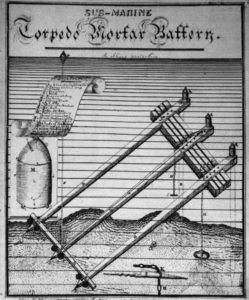 Southern inventors also developed offensive mines, but these proved less successful because they had a lower chance of encountering targets. The North implemented its now-famous Anaconda Plan early in the war. Similar to a snake strangling its prey, the Union hoped to force the South into surrendering by closing off its supply lines. 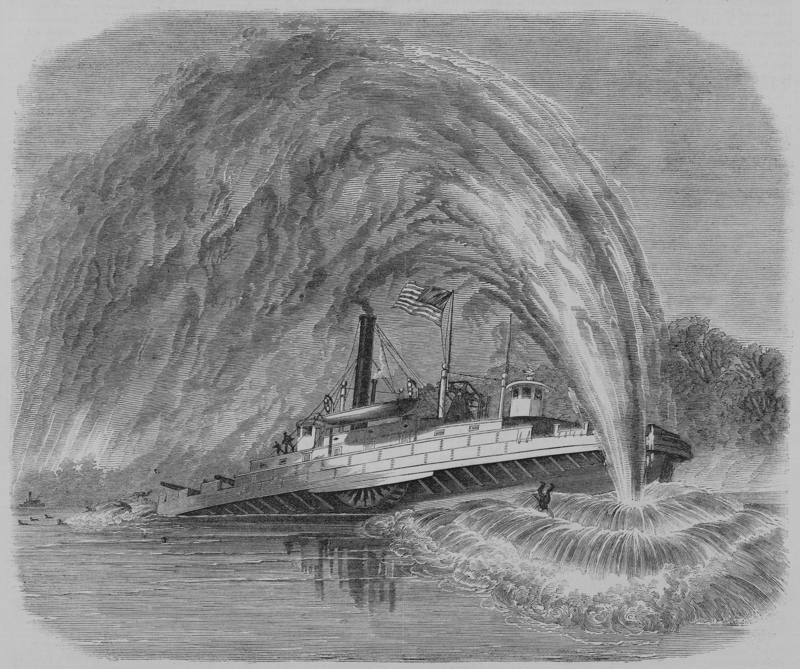 Union ships blockaded Southern ports while Union forces attempted to take control of the Mississippi River, thereby cutting the south in two. 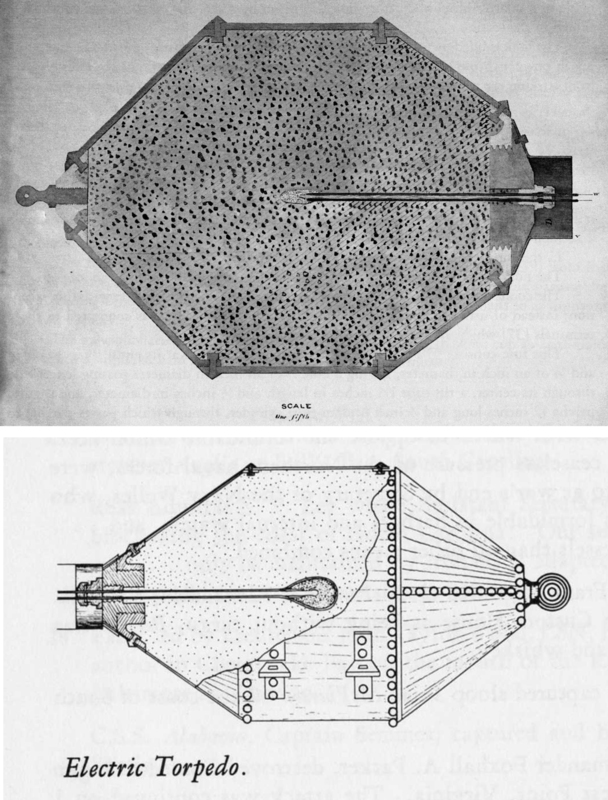 Keg mines (top) and frame mines (bottom) were the defensive mines most commonly used during the war. 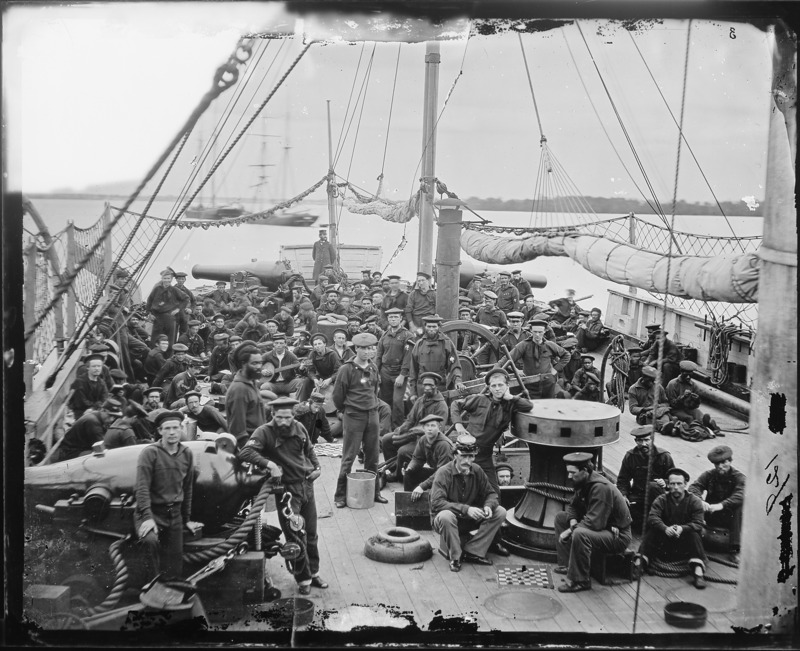 Confederates anchored them in their waterways to disable or slow Union ships attempting to capture Southern ports and cities. 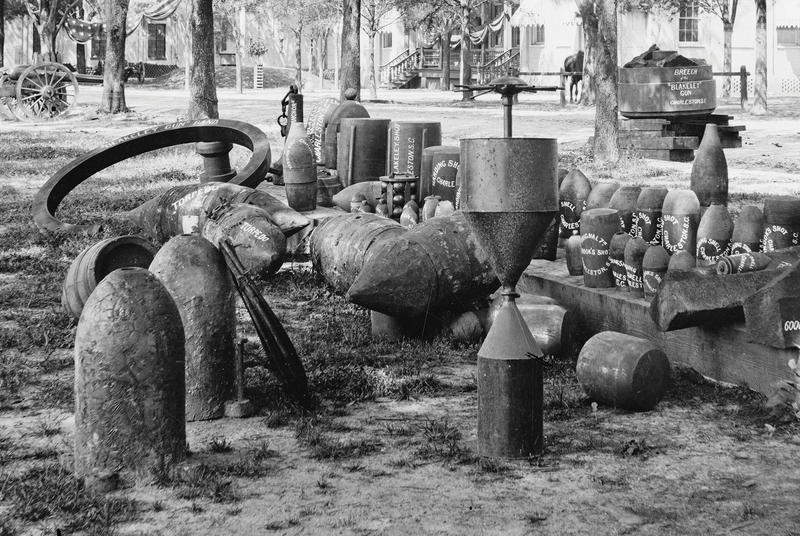 Moored to river bottoms, these mines detonated from contact pressure with an enemy vessel. Mines also acted as psychological deterrents. Union sailors (and even officers) feared waterways known to be mined. Their anxiety sometimes affected troop movements and attacks. The North saw little need for defensive or offensive mines. 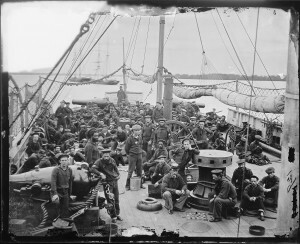 They rarely employed them and only sank one Confederate ship using mines during the war, ironclad CSS Albemarle in 1864. Although the threat of undersea mines initially kept the Union Navy at bay, by early 1862 the South needed to take a more offensive approach to the blockade. 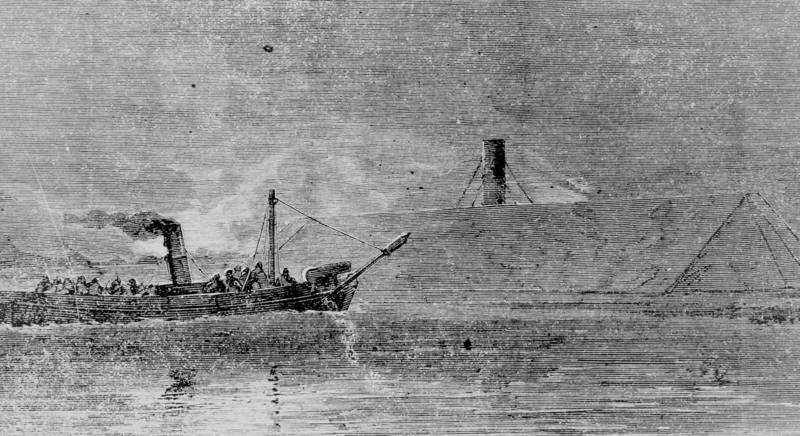 The Confederacy developed small, semi-submersible boats called Davids that carried mines on long spars attached to their bows. The Davids could approach Union ships at night, unseen, and ram their spar explosives into the targets. 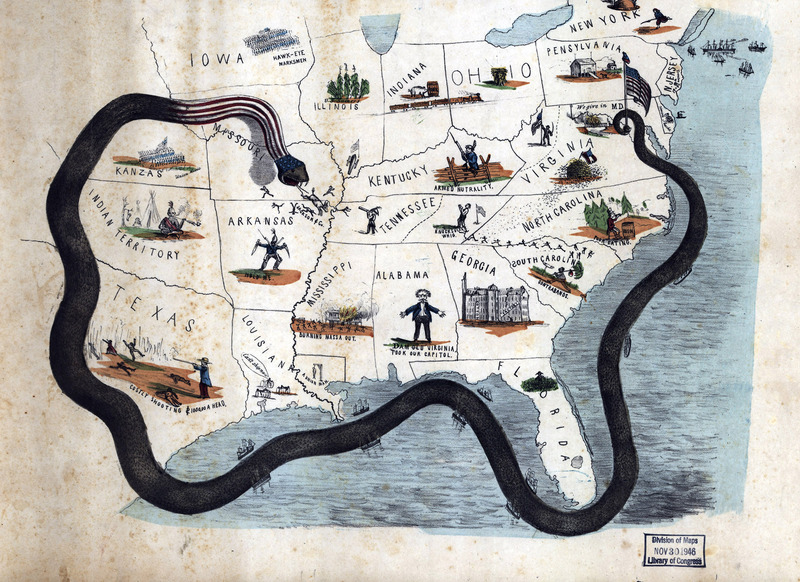 The Confederacy did not invent underwater mines or use them first. American inventors David Bushnell, Robert Fulton, and Samuel Colt had experimented with underwater mines leading up to the Civil War. Two Confederate individuals built on this work and significantly advanced mine design and technology. 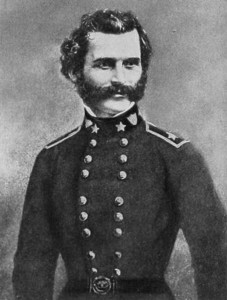 Confederate Navy Commander Matthew Fontaine Maury evolved underwater mines that exploded from the shore by electricity. Army Brigadier General Gabriel J. Rains adapted land mines detonated by pressure into mechanical mines that worked underwater. Their innovations transformed mines from experimental devices to functional, effective weapons. 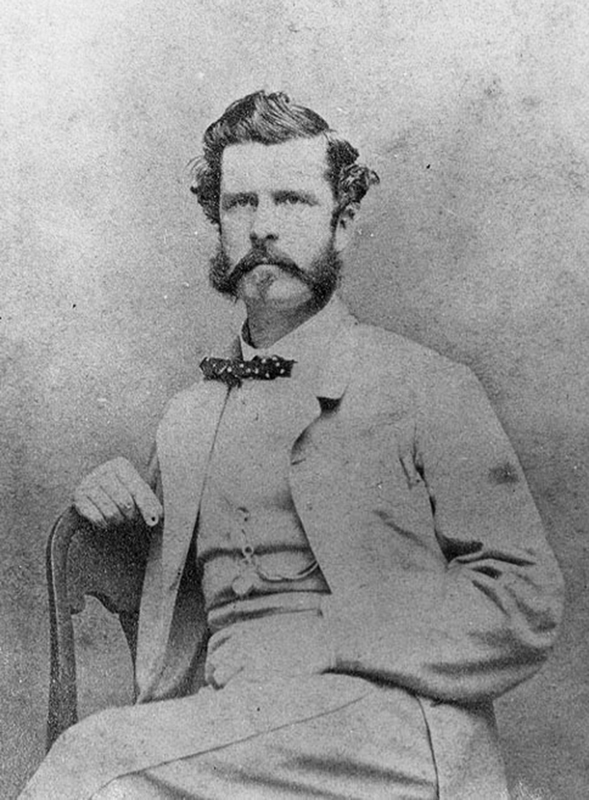 Gabriel Rains experimented first with land mines during the Second Seminole War (1835–1842). When the Confederacy nixed the use of land mines for moral reasons, Rains was transferred to “river defenses” to apply his inventions in waterways. 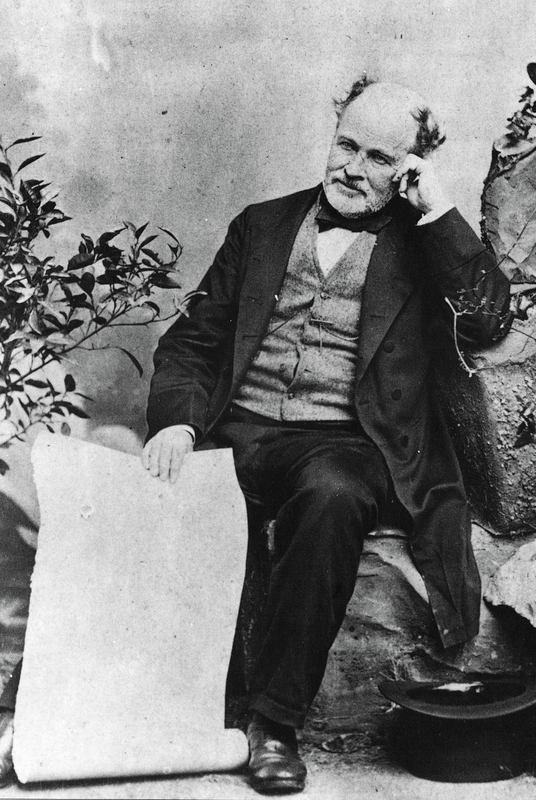 Matthew Fontaine Maury, known as the “Pathfinder of the Seas,” was a scientist and oceanographer before his work with electric mines during the Civil War. Historians believe Maury initiated Confederate use of underwater mines. 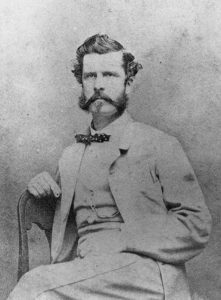 After Matthew Fontaine Maury was sent to Europe in June 1862 to procure critical naval supplies, including material to construct undersea mines, his assistant Lieutenant Hunter Davidson took over his duties. 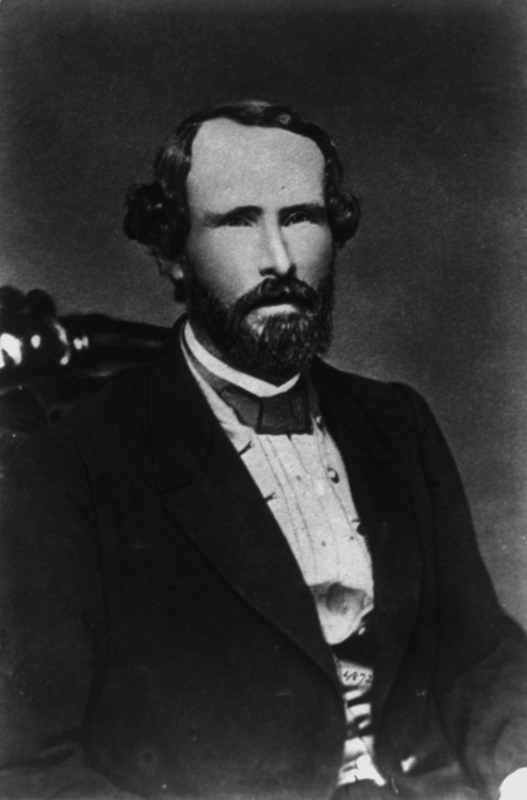 Confederate Army Captain Francis Lee invented the spar torpedo (mine) in 1862. Mounted to a long spar (pole) attached to a small boat, the spar torpedo placed mines in an offensive role. Much of the South’s success with mines came from standardizing their manufacture and distribution. In 1862, the Confederate Congress created two organizations that assumed authority over mine production and ended haphazard practices. 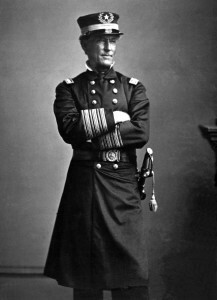 Matthew Fontaine Maury and his protégé, Lieutenant Hunter Davidson, headed the Naval Submarine Battery Service while Gabriel Rains ran the Army Torpedo Bureau. These professional services adopted standard procedures to methodically produce and plant underwater mines. They conducted research, recruited and trained mine specialists and technicians, standardized mine designs, and corrected flawed production methods. With the establishment of these systems, mine use grew in volume and effectiveness. Confederates did not improvise the assembly or look of their mines. 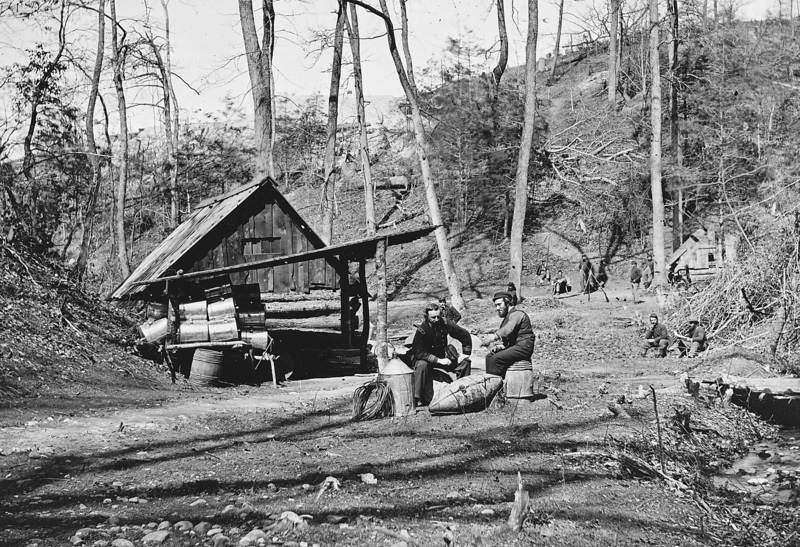 Although they sometimes utilized available materials like barrels or glass bottles, the design of Southern mines was planned and intentional. 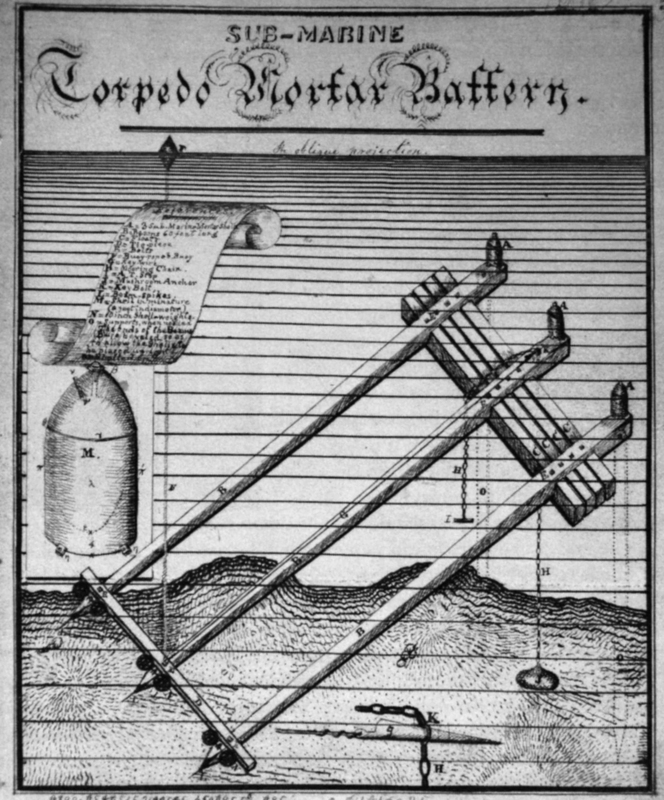 Gabriel Rains meticulously refined and documented his mine designs, including this one for a “Vertical Wood Torpedo,” in an unpublished manuscript he titled “Torpedo Book.” His granddaughter presented the document to the Museum of the Confederacy in 1926 and it was published in 2011. Both the Submarine Battery Service and the Torpedo Bureau established production stations in Richmond, Wilmington, Charleston, Savannah, and Mobile. The rustic appearance of this factory belies the sophisticated work performed at this site. Underwater mines did not change the outcome of any major Civil War battle, but they played important defensive and deterrent roles. 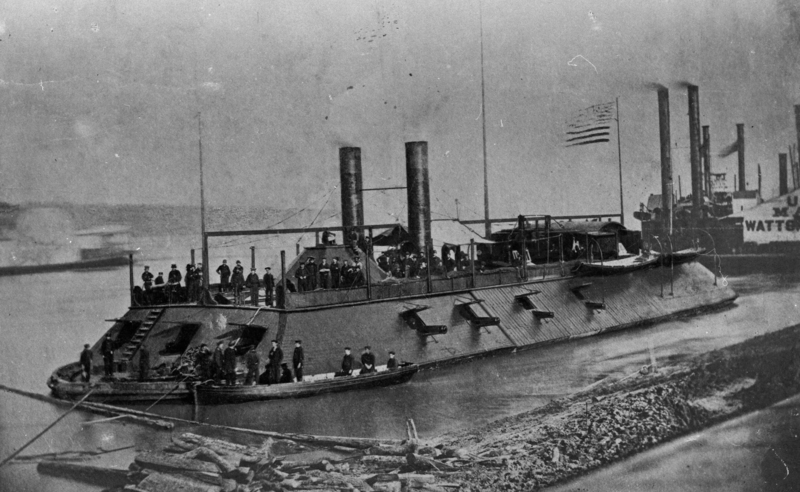 Mined waterways slowed the Union Navy by damaging its ships or forcing sailors to clear the mines before advancing. These delays gave Confederate forces time to retreat safely or await reinforcements. Confederates increased the effectiveness of mines by improving existing mine technology and standardizing mine production and deployment. Over the course of the war, their mines sank 29 Union vessels and damaged 14. In terms of damage done compared to effort expended, Southern mining efforts proved remarkably successful. Nations throughout the world took notice and adopted mines for their navies. 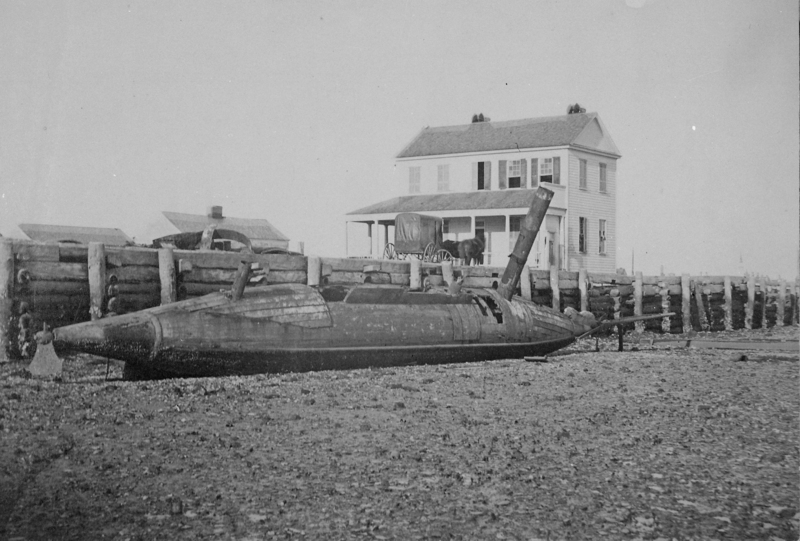 Two Confederate mines blew up the gunboat USS Cairo on December 12, 1862. 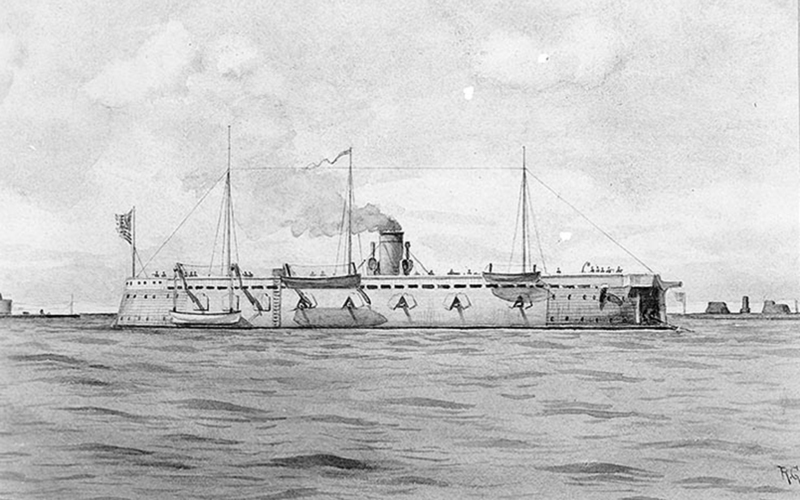 Cairo, the first Union ship sunk in the war by a mine, disappeared underwater in 12 minutes. 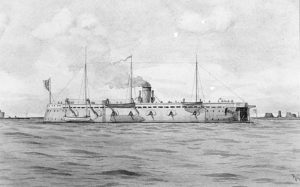 Union gunboat Commodore Barney sustained serious damage during a reconnaissance mission in August 1863 when an electric mine exploded beneath her starboard bow. 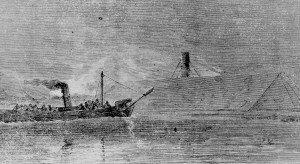 A David torpedo boat caused serious damage to Union ironclad New Ironsides in October 1863 when it rammed the Northern ship with a spar torpedo (mine). New Ironsides remained out of service for a full year undergoing repairs. Confederate submarine Hunley made history on February 17, 1864, when she became the first submarine to sink an enemy ship in combat. Armed with a spar torpedo (mine) attached her bow, Hunley attacked and sank Union sloop-of-war Housatonic in the Charleston Harbor. 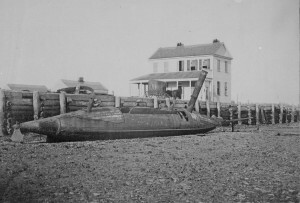 The best-known vessel lost to a Confederate mine was the ironclad USS Tecumseh (center) at the Battle of Mobile Bay in 1864. 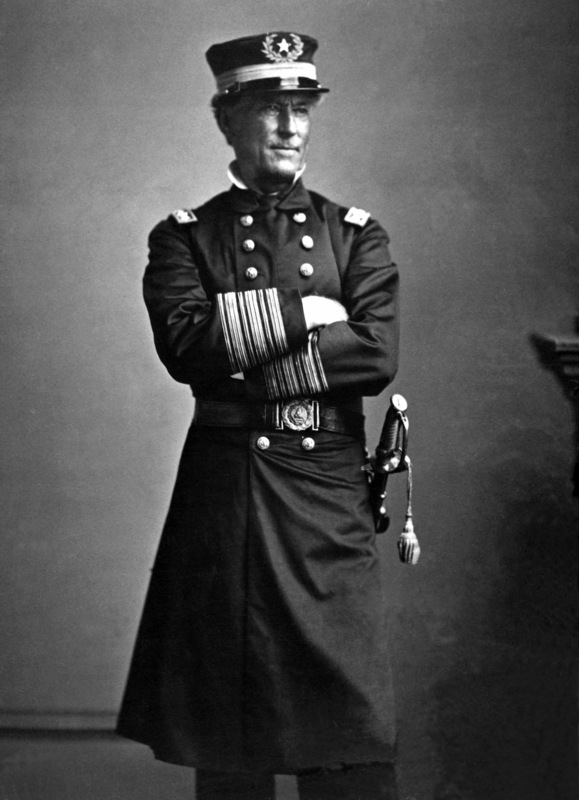 Admiral David Farragut’s reaction — “Damn the torpedoes [mines]! Captain, go ahead!” — became naval legend. 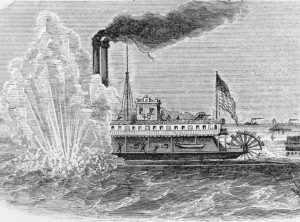 While trailing a Confederate transport vessel up the Blakely River in March 1865, Union ironclad Milwaukee fell prey to a mine despite actively sweeping for them. 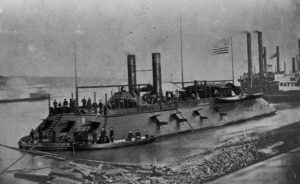 Just four days after Milwaukee’s demise, the Union Navy lost another vessel to a mine in the Blakely River. 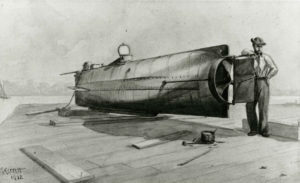 Armored gunboat Rodolph, ironically sent to raise the Milwaukee, struck a mine that blasted a ten-foot hole in her bow. Most Confederate mines served defensive purposes and were physically anchored to riverbeds or shores to deter the advance of Union ships. This approach worked more effectively than the deployment of offensive mines placed in waterways to drift into targets. 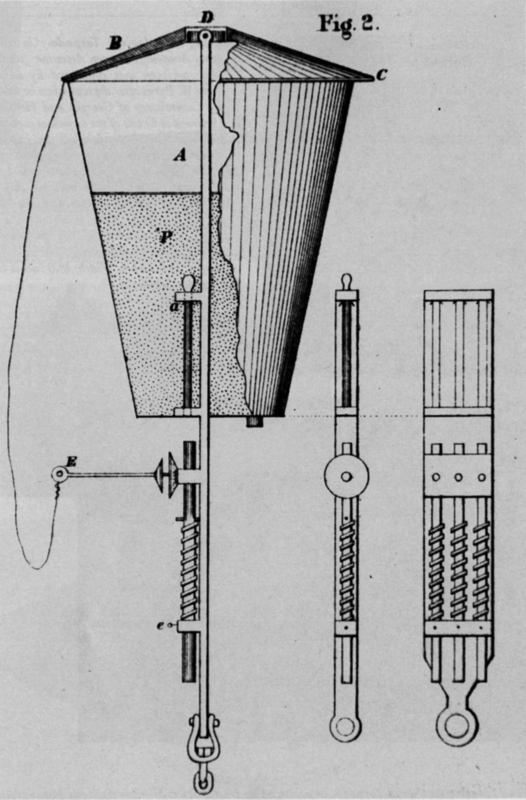 Inventors designed two types of detonating mechanisms that ignited black powder inside the mines. A mechanical mechanism triggered autonomously, usually when physical contact with a ship activated a chemical or mechanical reaction that generated a spark. An electrical mechanism received electric current through a cable when an operator on land manually closed an electric circuit. Texans John Fretwell and E.C. Singer invented these lantern-shaped mines that were among the earliest and most successful mines used by the Confederacy. Fretwell Singer mines were anchored to the bottom of waterways. When a ship made contact with one, the heavy plate atop the mine fell off, pulling a pin that released a spring-loaded plunger. The plunger struck a percussion cap inside the mine to explode it. Gabriel Rains designed these widely-used mines by modifying beer kegs. He added contact points around the barrel’s middle, attached conical ends to streamline the shape, and filled the body with gunpowder. Confederates fastened keg mines to river bottoms. When a vessel touched any of the contact points on the mine’s midsection, the pressure triggered a chemical primer to detonate the mine. 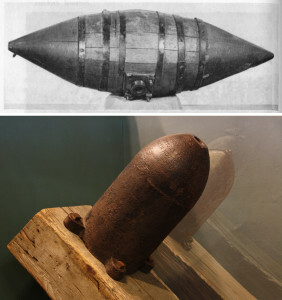 Frame mines consisted of iron artillery shells mounted to heavy wooden timbers. Each shell contained gunpowder and a chemical primer. 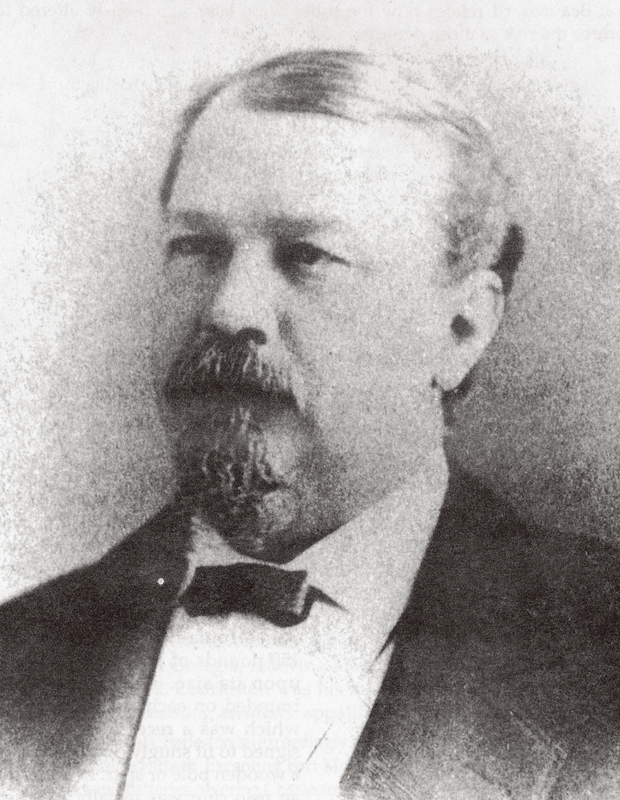 Gabriel Rains carefully perfected the sensitive primer formula that made these mines so effective. Timbers with frame mines were placed in rows on river bottoms. When hit by a ship, the mine exploded because the contact pressure activated the primer, igniting the mine’s fuse. Electric mines were detonated using electric current. An insulated wire connected an electric mine to batteries on shore. When an observer closed the circuit manually, electric current surged to the mine and exploded the gunpowder inside. 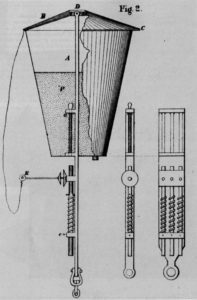 The electric telegraph, invented before the Civil War, employed the same mechanism: batteries generated electrical signals that were transmitted along long wires. 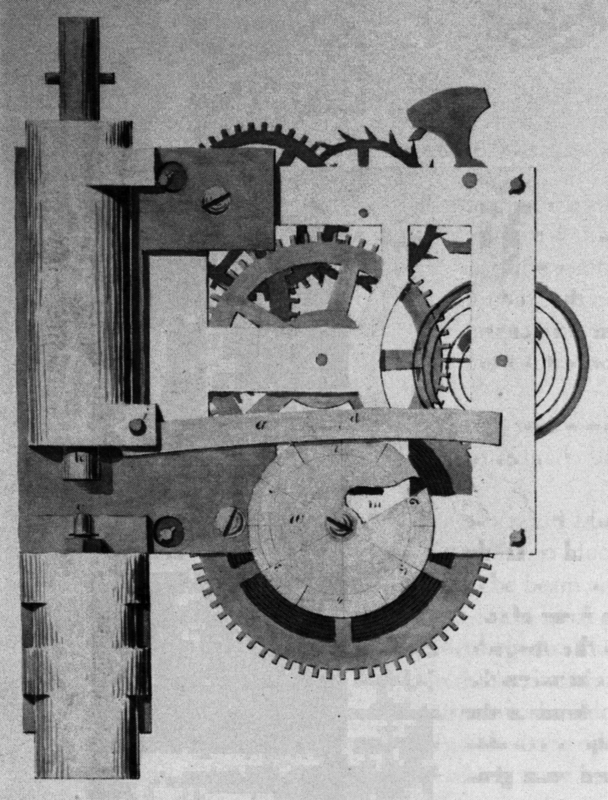 A horological mine was driven by a mechanical clock mechanism. 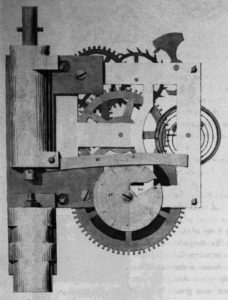 The mechanism’s gears connected to a spring-loaded rod that released when a designated amount of time had passed. 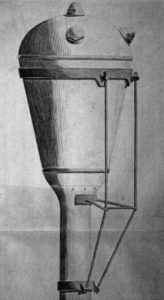 When sprung, the rod impelled its hammer into a percussion cap that exploded, setting off black powder contained within the mine’s body. Confederates lashed spar torpedoes (mines) to the bows of simple submarines. Carried into combat or sneak attacks, they were the most effective of the South’s offensive mines. The torpedo detonated when rammed into a ship by the submarine; the pressure of impact triggered the torpedo’s contact points, which exploded the gunpowder inside. The spar (long pole) that the mine was fastened to kept the submarine safe from the blast. 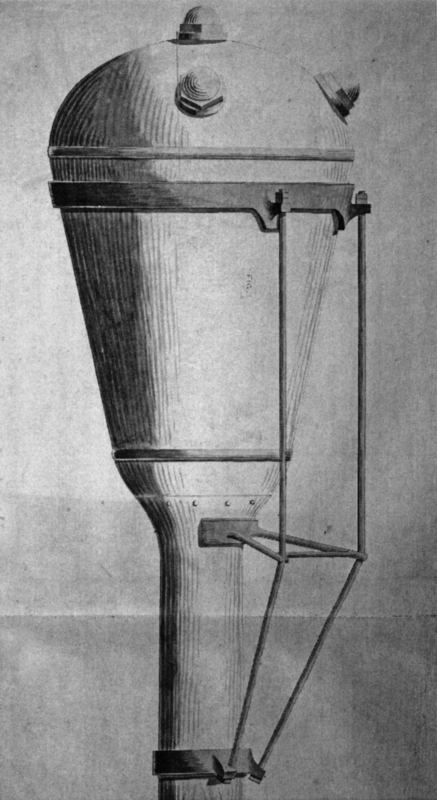 Swaying spar mines were one of the most effective Confederate designs. Five contact points on the mine’s head contained percussion caps that detonated the mine upon pressure. 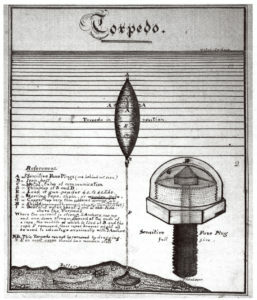 The mine’s spar (also called a boom) hooked into an anchor, allowing the mine to sway with the current when in place. 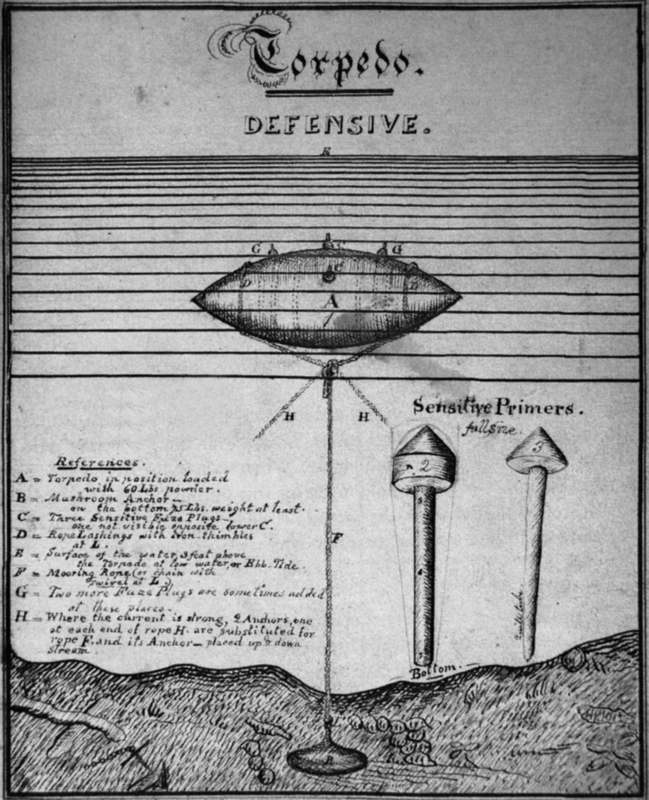 The shape and contact point placement of swaying spar mines made sweeping for or removing them difficult for the North. The current mine gets its name from the water current that triggered its detonation. After drifting into its target, the mine was immobilized against the ship’s side, held in place by the ship and surrounding water. The current or tide turned the mine’s propeller, releasing a lever that propelled a hammer to strike a percussion cap. The resulting spark exploded the mine’s gunpowder.